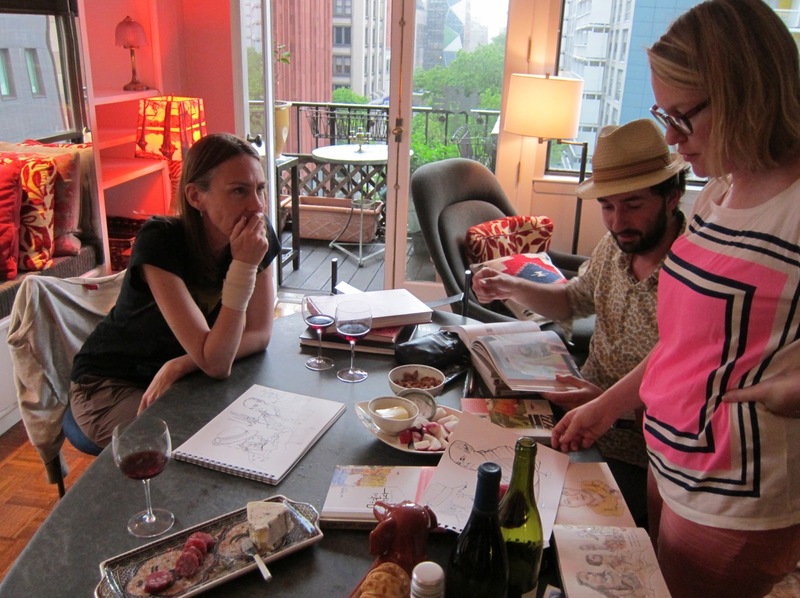 Louise Lapin drawing in my living room. 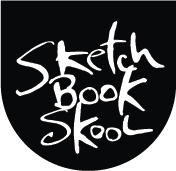 Veronica, Lapin and JJ share sketchbooks. 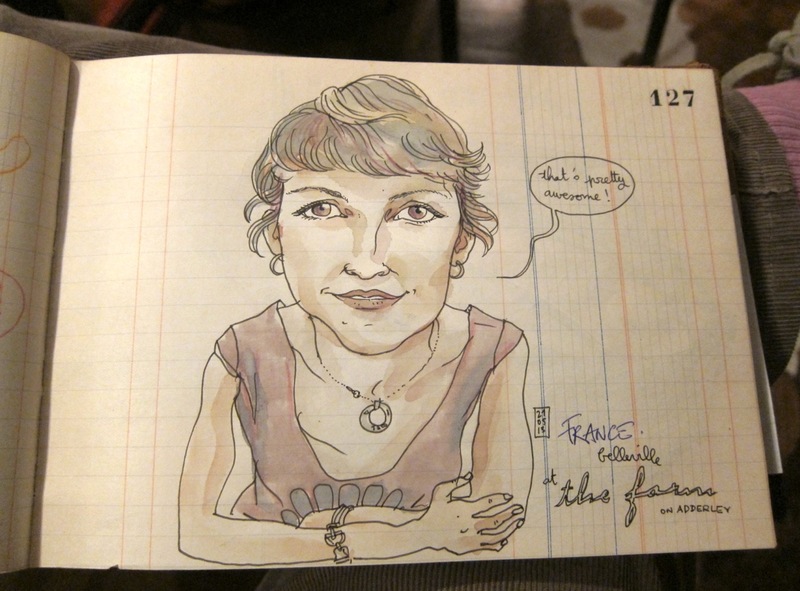 From Lapin’s sketchbook: Louise and other subway riders. We joked that one of Lapin’s eye’s is a fisheye. It might be the left one. 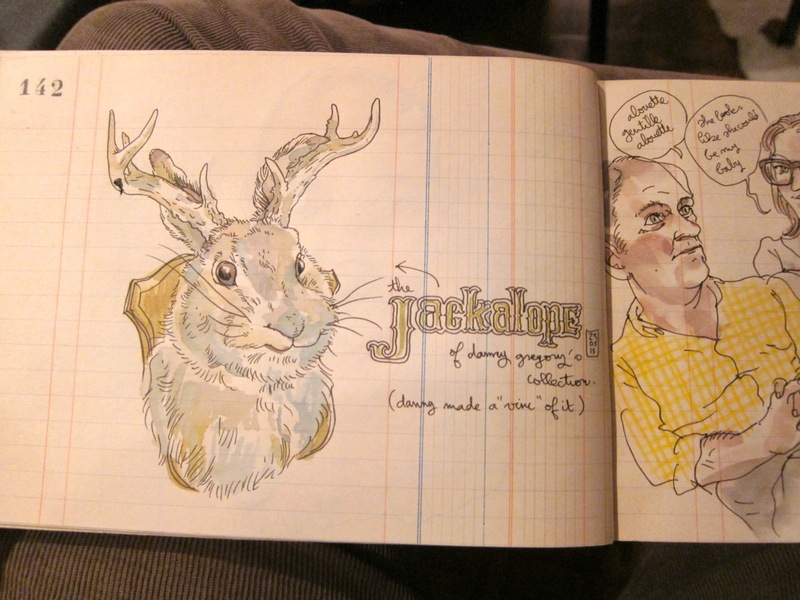 I recognized some drawing buddies and contributors to An Illustrated Life in Lapin’s sketchbook. This is France Belleville, the car loving genius. 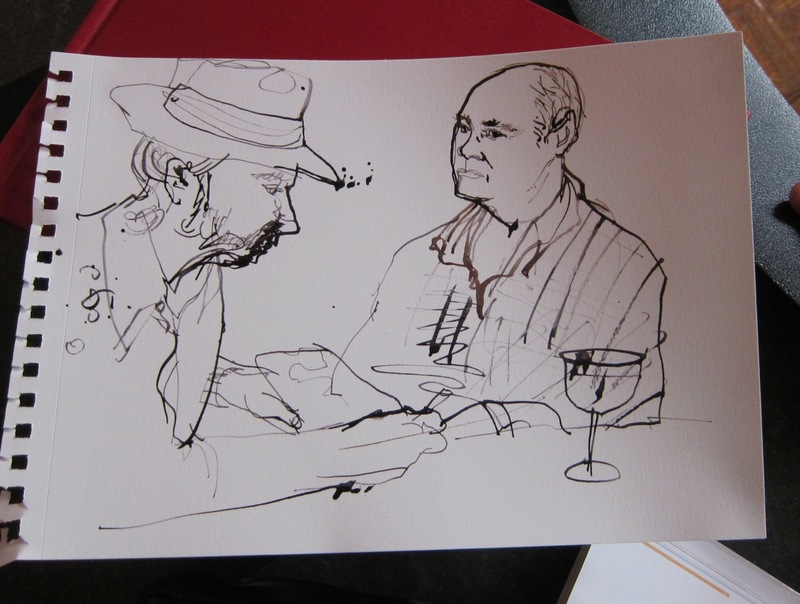 It was fairly intense being drawn by Lapin. He sat super close to me and insisted I look him in the eye the whole time. I felt we should have gotten married after. 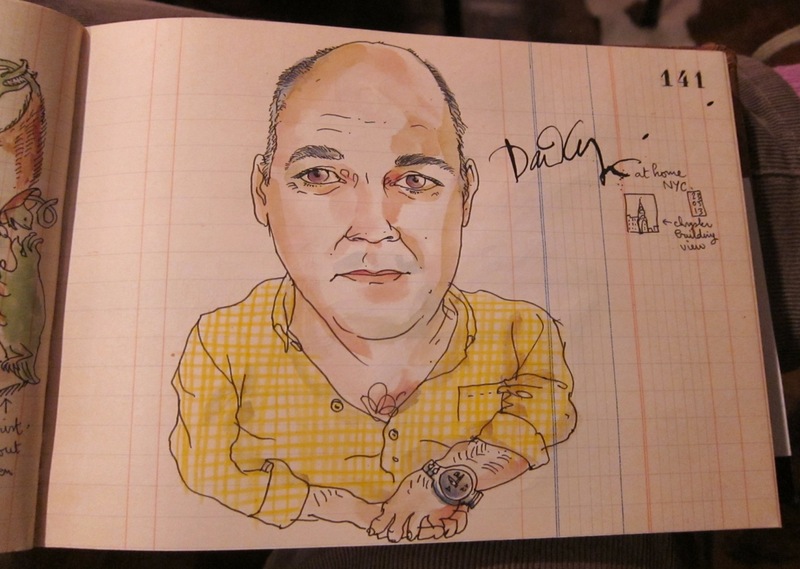 Veronica drew Lapin drawing me. I love her loose style. Veronica works so spontaneously she was able to knock out two amazing drawings while Lapin was still drawing every zit on my nose. 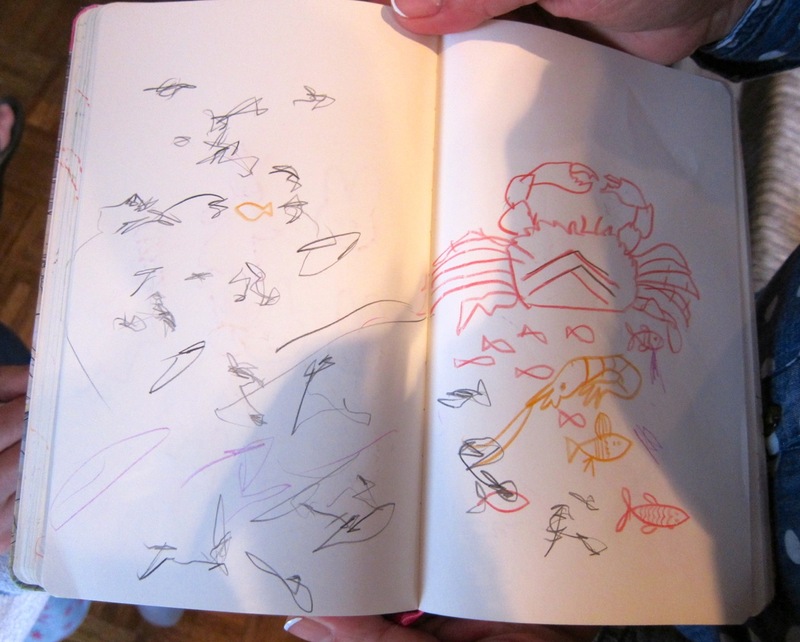 Lapin kept drawing while we talked. Here are JJ, Veronica and me well into our third bottle of wine. It’s only right that a Lapin is drawn to my jackalope. 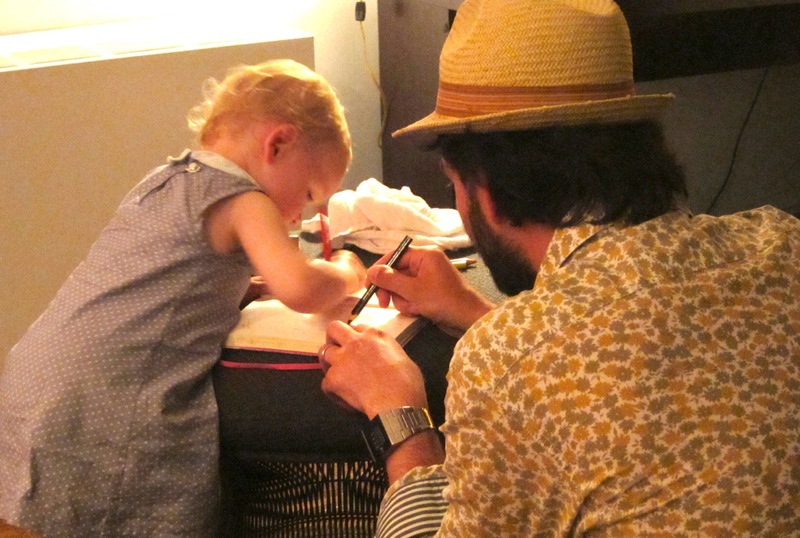 I have never seen a two-year old work so intently on a drawing. 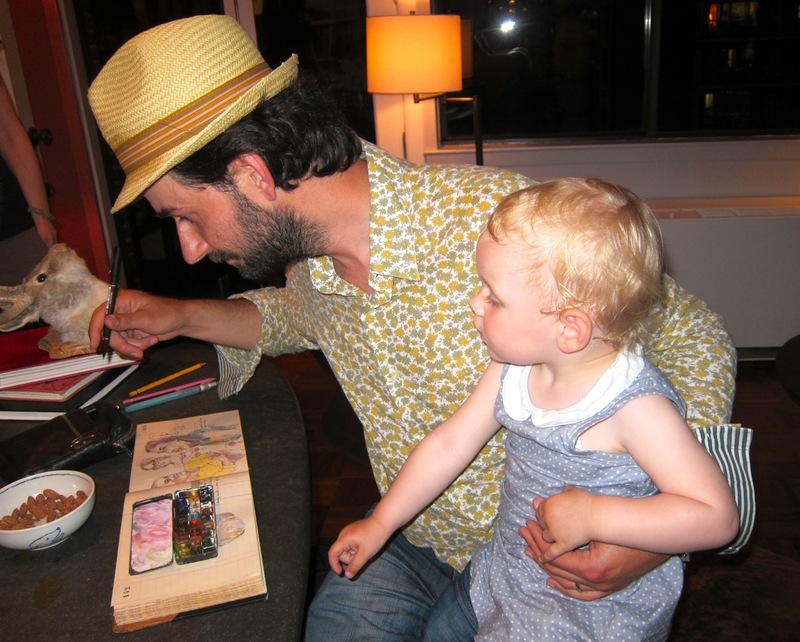 There’s more than one artist in this family. Previous Post The Avidor’s Big Adventure. look at how she is holding the pencil! My kids took ages to learn that. Beautiful family and friends moment…. Trop cool tout ça! 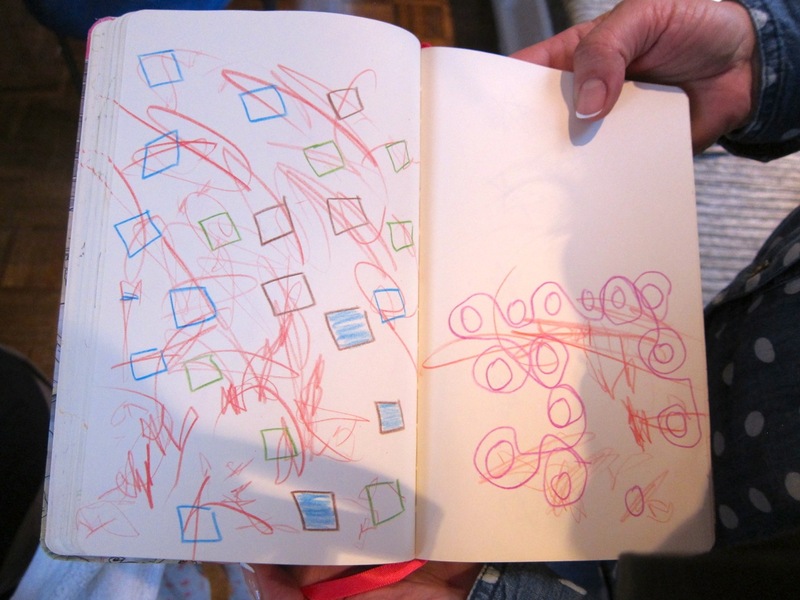 Wonderful drawings, lovely light room & gathering. Love the stamped (?) 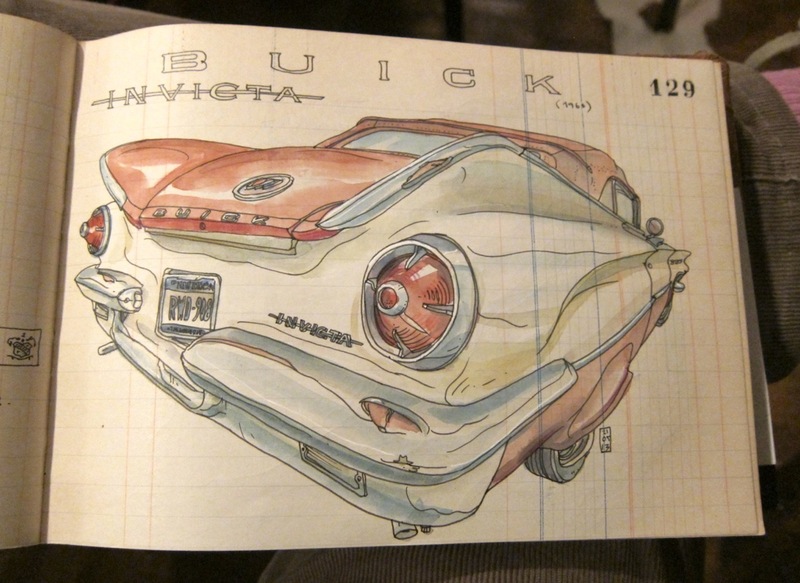 page numbering in Lapin’s sketchbook. Love his light & almost ephemeral style. 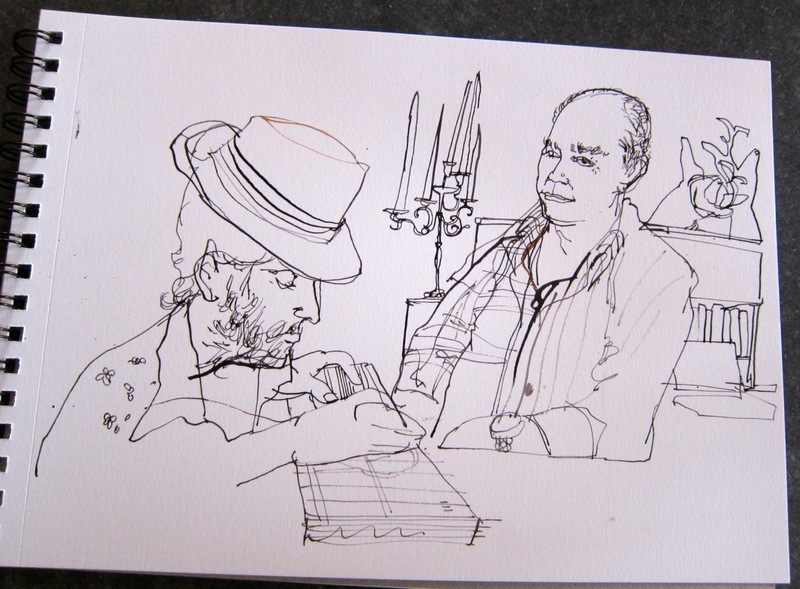 In the video interview, Lapin explains that he loves to draw inI old ledger books. how come you say “vin” instead of “wine”? …is the Romanian word thou, so I understood. lovely friends you got!!! amazing post! I felt we should have gotten married after. LOved this line too. Funny! What a fabulous collaboration of creativity! That little girl is amazing!!! Can’t wait to see what she does as she gets older!!! Thanks so much for sharing this delightful post! What a fun time with artistic friends! Thanks for letting us have this intimate peek into your soirée! Absolutely fascinating video. I learned so much and you are both delightful people. I so enjoyed this. Marvelous experience! Thanks so much for sharing this with us! Wonderful feel good photos. Thanks for sharing them. That looks like a great night, Danny! No better path to conviviality than drawing together over a bottle. Beautiful! 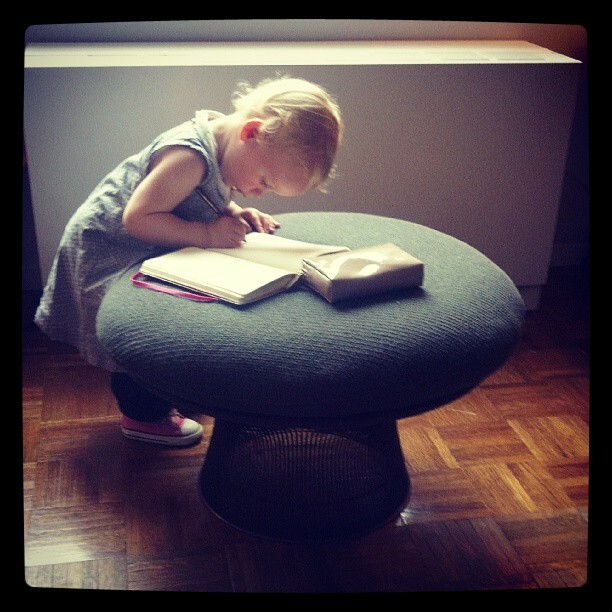 And how inspiring to see a little one follow in her parents’ footsteps. 🙂 I followed in my dad’s, and now my kids are following in mine, and I’m thankful every day. What a fun evening you had! Danny, what kind of pen does Lapin use? Inquiring minds want to know. 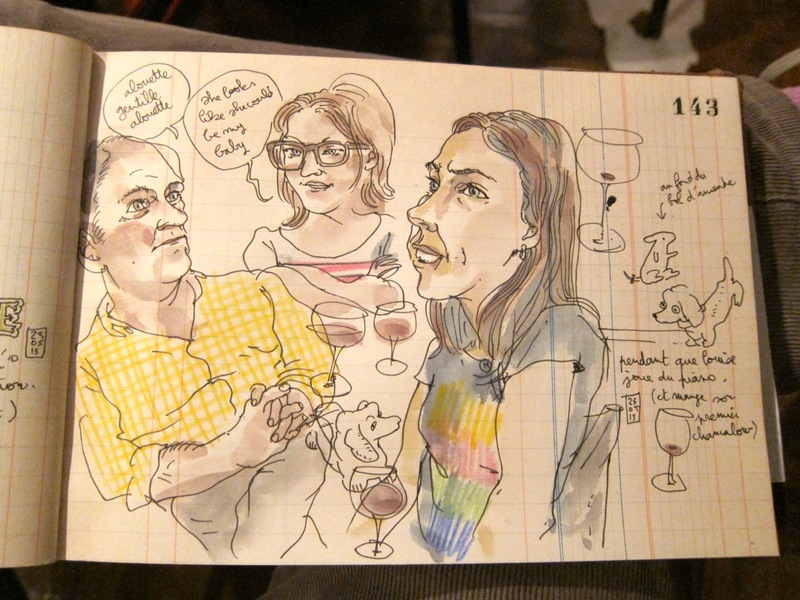 What a wonderful time we had laughing and drawing and drinking wine! Thank you Danny and JJ for your hospitality.